I know I am a complete wierdo, but I totally crave things that are chock full of vegetables. This stew practically jumped out at me from the pages of EveryDay Food a few weeks ago. It was a cold day, so the thought of a hearty vegetable stew really made me happy. 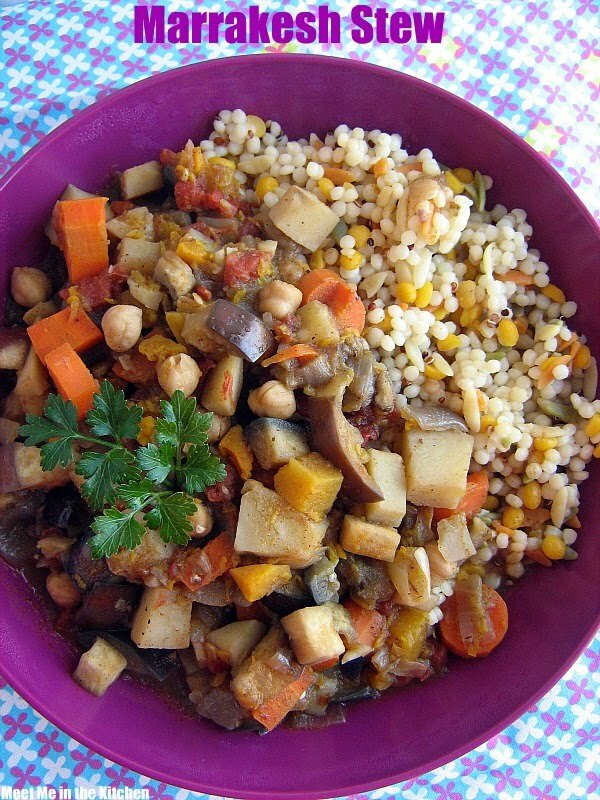 Carrots, eggplant, butternut squash, potatoes, tomatoes and chickpeas- what a healthy, delicious combination. I am always a little bit skeptical when cinnamon is called for in a savory recipe, but with the cumin, coriander and cayenne, the cinnamon really played a nice part in the flavor here. It worked well with everything else that was going on in this dish. Now, this stew is not beautiful to look at, but it is wonderfully spiced and delicious. I warned my family not to make any comments about how this looked, but to give it a chance and try it first, and they were all pleasantly surprised at how tasty it was. This makes a lot of stew, so I have a large ziploc bag of it in the freezer, along with the leftover Israeli couscous mix, just waiting for a busy night a couple weeks from now, when I can just put the frozen stew on the stove and have an instant dinner. I love it when there is enough of something leftover that it can be dinner again in a couple of weeks! In an 8-quart Dutch oven or heavy pot, heat oil over medium-high. Add onion and cook, stirring occasionally, until soft, about 5 minutes. Add spices, and cook until fragrant, 2 minutes. Add carrots, potatoes, and squash and season with salt and pepper. Cook, stirring occasionally, until beginning to brown, 5 minutes. Add tomatoes and broth- vegetables should be completely covered by liquid; add water to cover if necessary. Season with salt and pepper. Bring to a gentle simmer and cook, uncovered, for 20 minutes. Add eggplant, stir to combine, and simmer until eggplant is tender, 20 minutes. Stir in chickpeas, season to taste with salt and pepper, and cook until chickpeas are warmed through. *I served this over the Harvest Grains Blend from Trader Joe's- a combination of Israeli couscous, orzo, and red quinoa. 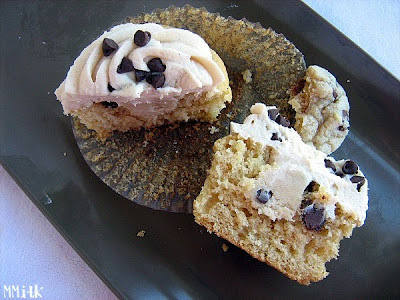 I found these cupcakes months ago and knew that they would be the perfect birthday treat for my hubby. 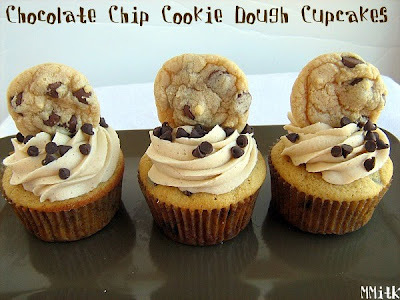 He is an absolute lover of chocolate chip cookies and the dough you have to make to get them. My hubby's birthday is on December 23rd. 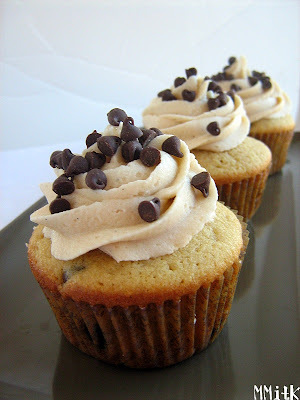 That was the perfect day to make these cupcakes because we were having a Christmas get together with some family that night and I knew I would be able to take these to share as a dessert. I wouldn't say any part of these cupcakes was complicated, but there were 4 separate things to put together, so it took a fair amount of time. 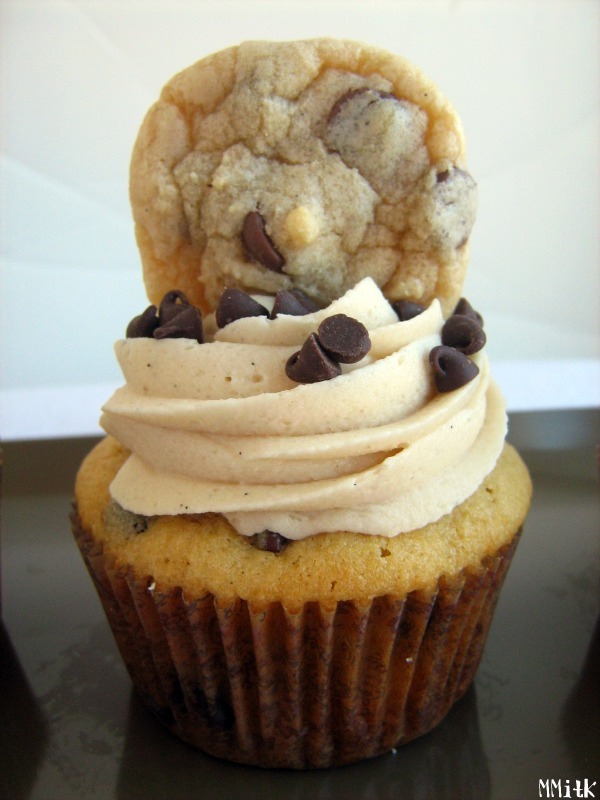 First- the cupcake batter, then the eggless cookie dough filling, the cookie dough for the cookies to top the cupcakes, and lastly, the frosting. The cupcakes turned out beautifully. I didn't get my cookie toppers as small as I could have, but I was happy with the results. Tracey nailed these a couple weeks ago- check hers out! 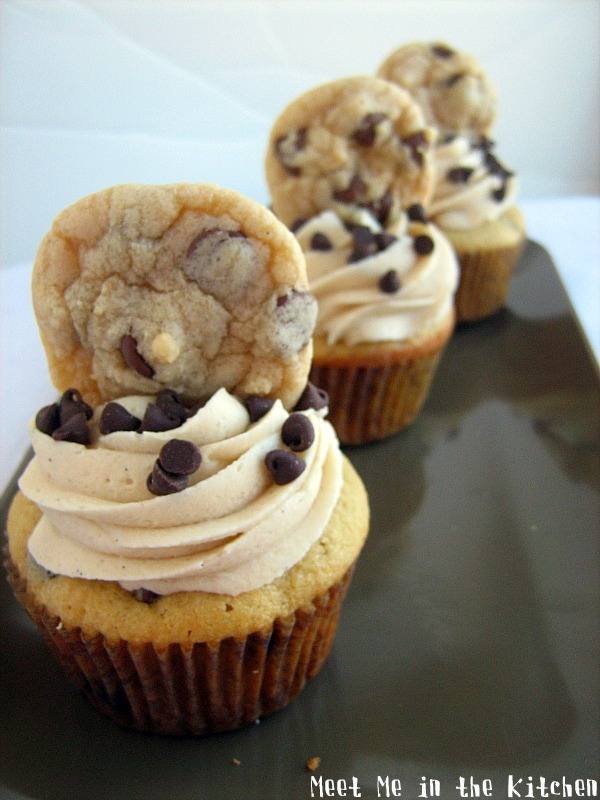 The thing about these cupcakes is that each part tastes like cookie dough. I'm not a big fan of chocolate chip cookies or the dough, but I was amazed at how much the frosting in particular, tasted like CCC cookie dough. These were really popular with certain people. My brother-in-law, who usually passes on all desserts I make because he just doesn't care, ate 2 whole cupcakes. I couldn't believe it. Overall, these were a beautiful, delicious hit of a dessert. This is actually New Year's Good Luck Dip. 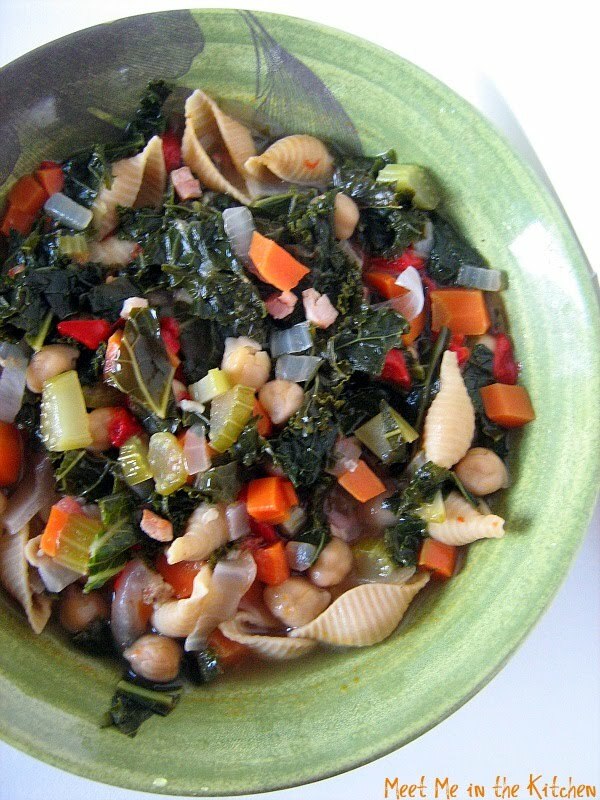 I saw it on Ezra Pound Cake a day or two before New Year's and loved this twist on collard greens and beans. I wasn't going to share it here since it has been a few weeks since New Years Day, but it was so delicious and I figured we could all use some good luck, probably more than just on the first day of the year. 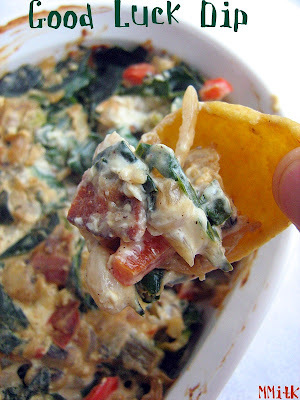 You can't really go wrong with dip and this one has some healthy stuff in it. This dip starts out with a little bit of bacon. You cook a sweet onion, red bell pepper and then add the collard greens, and cook them down until they are nice and wilted. You might be thinking that collard greens can't fit into a dip. But they can. Make sure you finely chop the collard greens. To lighten this dip up a little, I used nonfat cream cheese and nonfat Greek yogurt. I was actually kinda surprised by how yummy this dip was. I also added some black-eyed peas since we had this dip the same day as the Southern Egg Rolls. I used whole wheat pita chips as my main dipper, but I think it would taste great with veggie sticks too. Since it was sort of a New Year's party for our family, I splurged and bought some Frito dips, so they could use those to dip into this dip. 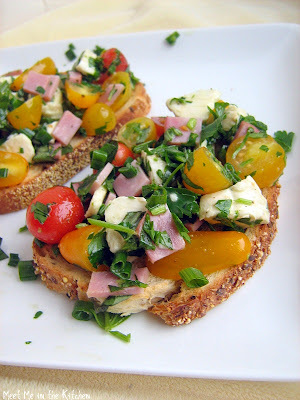 This was a great recipe and we loved how it turned out. I enjoy eating salad, but I find that I need lots of variety with my salads so that I don't get bored. This salad was just about perfect in every way. Quinoa is the star of the show, or in this case, the star of the salad. 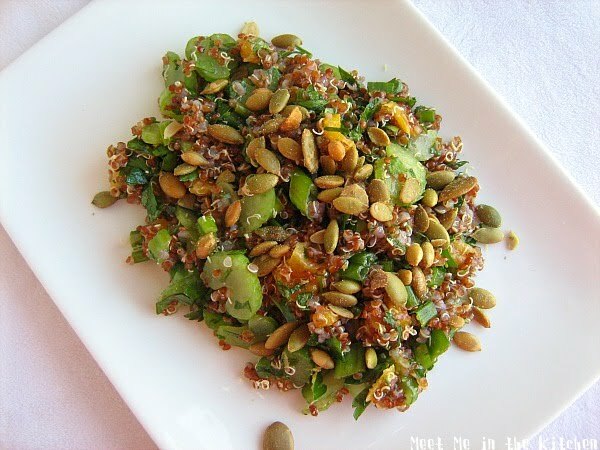 Celery adds a nice crunch, as do the pepitas. The dried apricots add just the perfect amount of chewiness and sweet. I actually omitted the honey from the dressing because of the dried apricots. If there is one thing I can't handle in a salad, it is too much sweetness. I prefer the savory-ness to win out. There is lots of parsley, which adds so much freshness and flavor. Green onions add a little bit of spice/heat. The dressing is nice and simple, just the way I like it- olive oil, fresh lemon juice, salt and pepper. I actually served this over romaine and it was a great combination. The next day I fried an egg in a tiny amount of olive oil and had it with the leftovers. Delicious. I also shared this recipe with my mom a couple of weeks ago when she called to ask me for some meal ideas and she report back that they loved it too! 2. Whisk lemon juice, olive oil, honey, salt, and black pepper. Add to quinoa mixture, and toss well. Top with seeds. Sometimes I see a recipe that looks a little bit wierd and interesting at the same time, so I have to try it. This was one of those. I couldn't get over the idea of a fried egg on top of a burger. The more I think about it, I guess it isn't that strange. 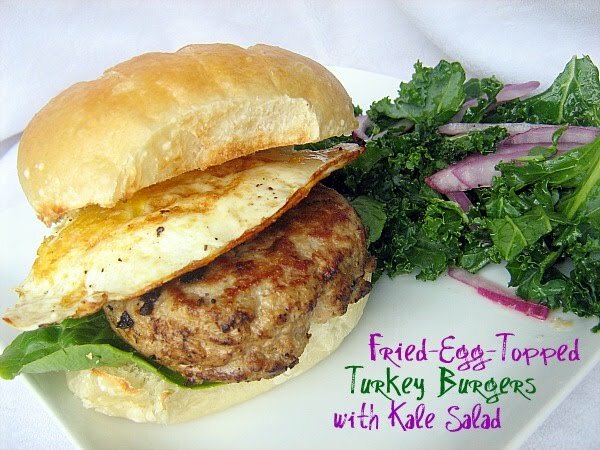 Kind of the same idea as a breakfast sandwich with egg and some sort of meat, just switched around a bit. We don't eat burgers often, but every once in awhile we have some version of a burger and this time they just happened to be topped with a fried egg. Maybe this is some sort of food fad, but if it is, I have never seen it before. I changed a few things- like getting rid of the mayo that was on the bread, and switching out the Italian bread for a bun, but mostly we stuck to the recipe. We added romaine to the burgers and my kids even had some ketchup. Eggs and ketchup can go together, right? The kale salad was the perfect thing to have on the side. Crunchy, raw and slightly tart. Letting the kale marinate in the lemon juice/olive oil softens it a little, but it still keeps lots of crunch. If you make burgers at home often, this would be a fun way to change it up a little bit and even if you don't, it still makes a great dinner. When I was a kid, waking up on Christmas morning, we would always find a box of "sugar" cereal from Santa Claus. It was such a treat because the rest of the year, we never had that option. We lived on Shredded Wheat, mush, cornflakes or some other healthy item. Because we got sugar cereal as a gift, we always ate more than a few bowls of it for breakfast, meaning that we didn't usually have a special Christmas morning breakfast. Well, once I got married, my husband nixed the "sugar" cereal gift, because he thought it was silly. No big deal- mostly because that left me the choice of what we would have on Christmas morning for breakfast. I asked everyone what they wanted this year and they chose biscuits and sausage. I gave them what they wanted, but included this beautiful salad also. This salad is a beautiful mix of some of the wonderful fruits that appear this time of year in the grocery store. 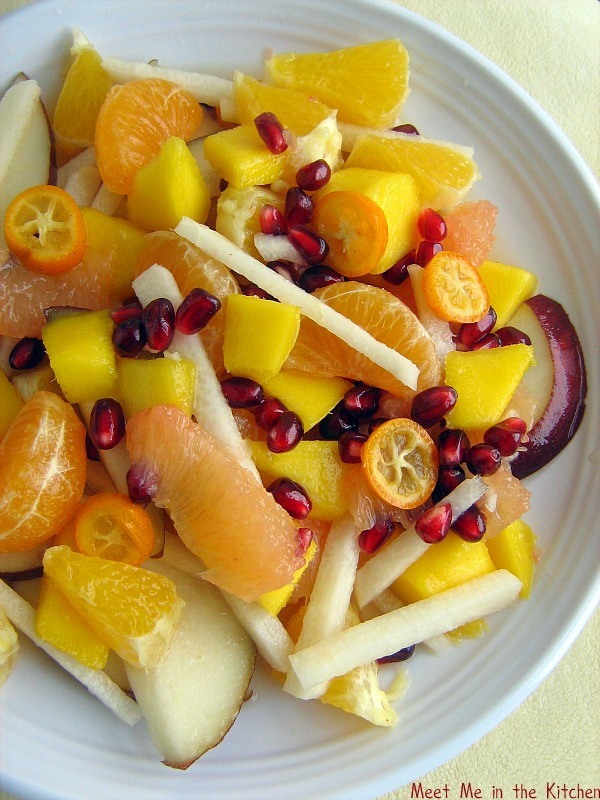 We love pomegranates, clementimes, and mangoes and they were all superb in this mix. We also eat a lot of jicama, which added a nice little crunch to the salad. I was happy that I was able to find ripe kumquats too. My kids really liked those little guys. The light lime juice-honey dressing that has a little bit of heat from the ground red pepper, really pulls it all together. This was beautiful and delicious. I love it when something looks so pretty and colorful and also has great tastes and textures. I know I've said this before, but you need to know that I am not a true Southerner. Therefore, I cannot be held accountable for things that I say or make that have the word "Southern" in front of them. 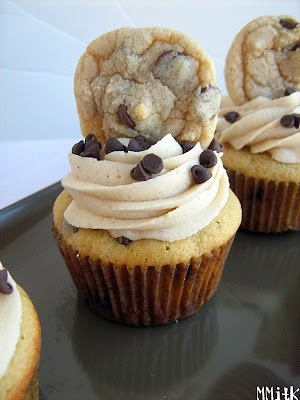 I did find this recipe on a blog that is written by a real Southerner, so, well, so, that is that. I saw this recipe a couple of days before New Year's and loved this twist on the traditional black eyed peas and collard greens, that people eat around here on New Year's to bring good luck for the coming year. I love anything that isn't traditional and adds a little flair to the ordinary, so I decided to make these on New Year's Day. They are so good that I think you should make them any day. I decided to bake these egg rolls because I have baked egg rolls before and you can still get a nice crunchy shell, without all the extra fat. Plus, being a true non-Southerner, I don't fry things. I am here to tell you that these little guys taste great baked. And with a few changes. But, if you feel like frying them, I'm sure they taste really yummy that way too. They also tasted great the next day, cold, straight out of the refrigerator. 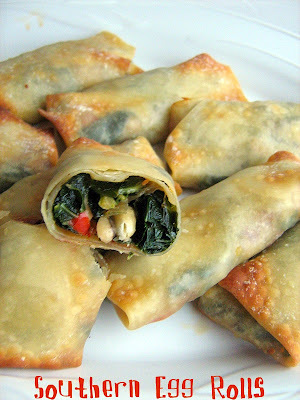 * this recipe calls for frying the egg rolls, but I have made egg rolls in the past and decided to bake them instead. 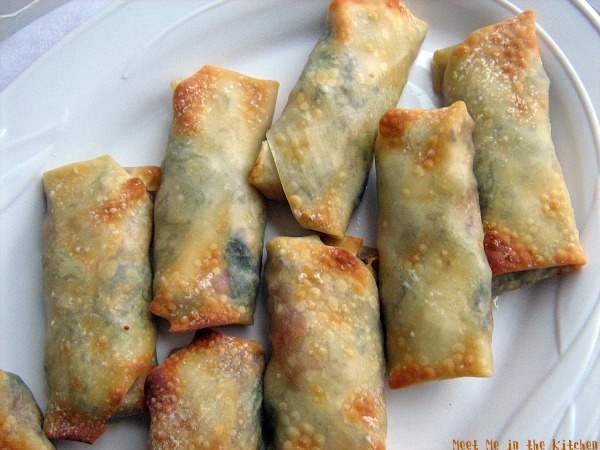 Prepare the egg rolls as you would for frying, but lay them on the prepared baking sheet, folded side down. Spray the tops with cooking spray. Bake for about 18 minutes or until the outside is golden brown and crispy. I'm halfway through my month without butter and we are doing great. I haven't used it yet, although there have been a few times that I really wanted to! 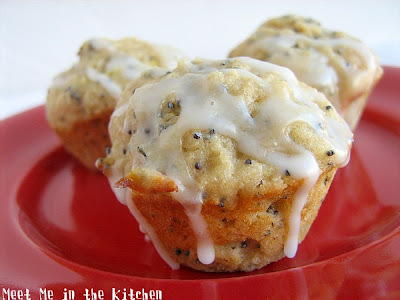 I knew these Lemon Poppyseed Muffins Betsy picked for Tuesday's with Dorie today would be an easy recipe to modify and they turned out really yummy. You can go get the original recipe at A Cup of Sweetness where Betsy has it posted. 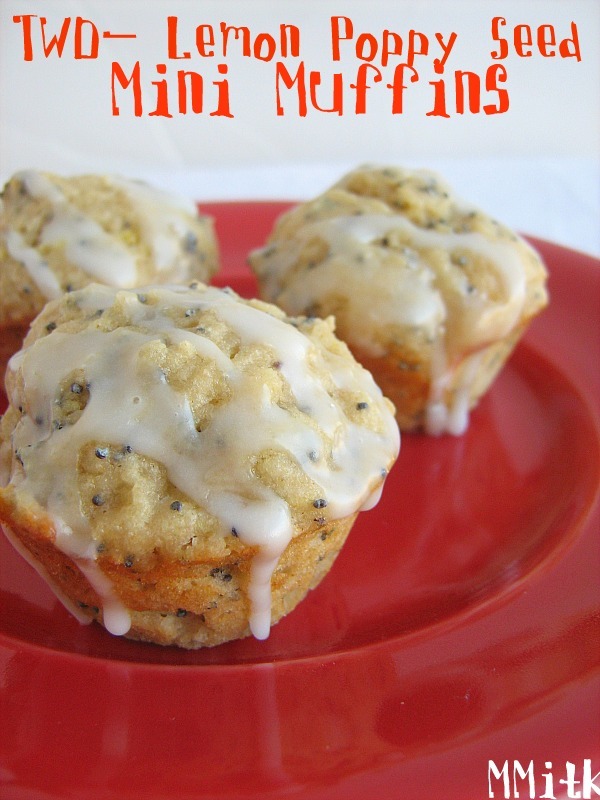 I used white wheat flour, nonfat Greek yogurt, low-fat buttermilk, and a little canola oil to keep these muffins nice and moist. I only made 1/2 of the recipe since I was making mini muffins and I got 24 of them. These muffins were really good. Nice and lemon-y. Definitely a success. I love mini muffins because they are just the right size for a 2-bite snack. Go see the other muffins and variations at TWD! Preheat to 400 F. Spray your muffin pan with nonstick cooking spray or line the cups with paper liners. In a large bowl, rub the sugar and lemon zest together with your fingertips until the sugar is moist and the fragrance of lemon strong. Whisk in the flour, baking powder, baking soda and salt. In a large glass measuring cup or another bowl, whisk the nonfat greek yogurt, buttermilk, canola oil, lemon juice and vanilla extract together until well blended. Pour the liquid ingredients over the dry ingredients and, with the whisk or a rubber spatula, gently but quickly stir to combine. Do not overmix the batter - a few lumps are ok. Stir in the poppy seeds. Divide the batter evenly among the muffin cups. Bake for 9 minutes, or until the tops are golden and a toothpick inserted into the center of the muffins comes out clean. Transfer the pan to a rack to cool for 5 minutes before removing the muffins and let them cool completely on the rack before icing. To Make the Icing: Put the confectioners' sugar in a small bowl and add about 1 Tablespoon of the lemon juice. Stir with a spoon to moisten the sugar, then add enough additional lemon juice, a dribble at a time, to get an icing that is thin enough to drizzle from the tip of the spoon. Drizzle lines of icing over the tops of the muffins. I've never had Latkes before, so I am certainly not an expert. I have no idea how they should taste, what they should look like, etc. I just saw a section of Cooking Light recently that was dedicated to different types of latkes and these ones, with the combination of butternut squash and potatoes, caught my eye. I liked the idea of the apple salsa too. I tackled this recipe the day after Christmas. There was all this talk of it snowing here in Georgia for Christmas and I really didn't think it was going to happen. Maybe it is because I can't stand the white stuff or just because I like to think that it is impossible for snow to come here (even though it has on occasion), but sure enough, Christmas night, it started to snow. And it didn't stop until the next morning. Church was canceled, we were snowed in and it felt like the perfect day to try these guys. The peeling and shredding of the squash and potatoes is what takes up the most time, but when you are snowed in, what else are you going to do? Draining the liquid in a colander didn't work for me, I had to literally squeeze out all the liquid. 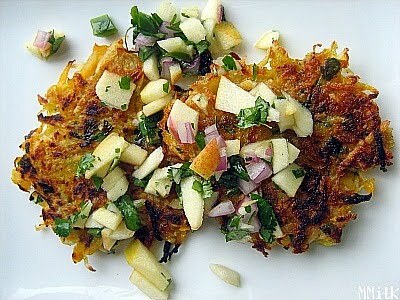 I had read or heard somewhere that this is a very necessary step to have good latkes. 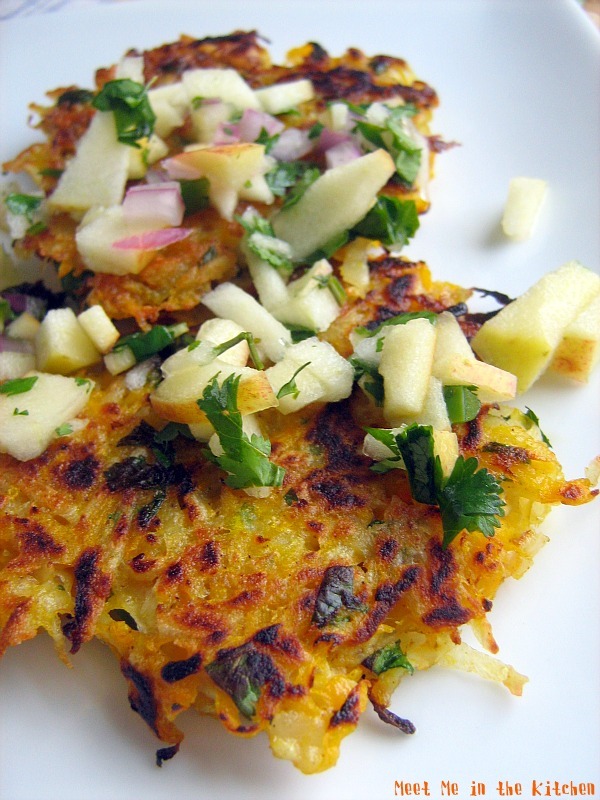 There was a nice bit of heat in these from the jalapeno (I used this instead of a serrano pepper) and I have to say that I think the apple salsa was a really nice compliment to these latkes. My daughter & I really loved these, some of the others thought they were just okay. I served them with a little bit of unsweetened, natural applesauce and a dab of greek yogurt, alongside the apple salsa. I know it is going to be very hard to believe, but we are on our 4th snow day here. My kids are getting so used to sleeping in and playing on the giant ice skating rink that is now our yard, that I don't think they will ever want to get up early and go back to school. The sun has come out though, so we might get some of this thick white stuff melted today. I remember as a kid/teen, my Dad always buying a large box of grapefruit or other citrus sometime in December. He would put the huge box in the basement or garage and all the members of my family would go and get the delicious citrus whenever we wanted to. It seemed like the box lasted forever and the fruit from it was always so good. There is something about citrus fruits in the winter. So, in honor of that memory and also because I was craving some delicious citrus, this December I bought a half-bushel of citrus from someone that I know, who was doing a school fundraiser. When the goods arrived, I couldn't believe how big a half-bushel is. I had more than my fair share of tangelos, tangerines, clementines, and a few grapefruit. The clementines and grapefruit were devoured first, while some of the tangerines and tangelos gave my kids a little trouble because of all those darn little seeds. 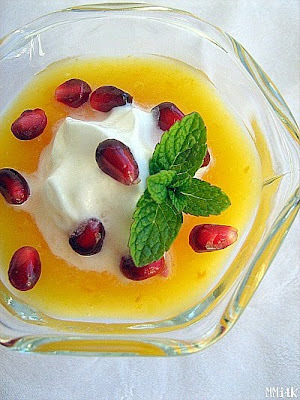 Anyway, some how I saw this picture and I knew that the remaining tangelo/tangerines must be juiced and turned into this beautiful pudding. I don't know why the color of my pudding isn't as orange and beautiful as that picture, but the taste I am sure was the same. Delightful. 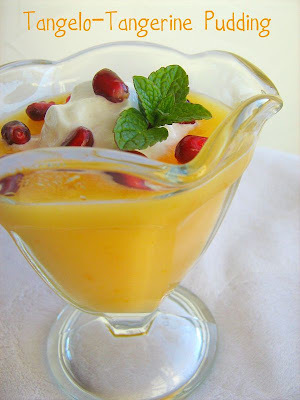 There isn't much too this dessert, but it is so refreshing. My entire family loved it. Of course, as soon as I made this pudding and put in in the fridge to chill, I went outside and checked the mail. The new Cooking Light had arrived and it contained a modified version of this pudding. Here we are on our 3rd snow day. I think this will probably be the last one though, because the sun is actually shining and that might just be enough to melt some of the snow and ice that has been causing such trouble for everyone around here. This also happens to be the 3rd recipe that I tried from Rachael Ray's Look and Cook, although I should add that this recipe for Breakfast Crostini, and the recipe I shared yesterday- Fennel and Pepper Salad, were both in the "extra" recipe section of the book that didn't have any pictures at all. So, no looking-and-cooking for me on this one. But that wasn't a problem, because this recipe was really easy. This recipe can also be found on multiple places on the web. All you do for this one is combine fresh mozzarella, prosciutto (I used Canadian bacon), scallions, basil, Italian parsley, tomatoes, and a little bit of olive oil. Then you toast some bread- I used Italian 5-grain (my daughter calls it seed bread) and top the toasted bread with the delicious salad. Super easy. Super delicious and really the type of breakfast I would love to have any day. It is basically like having a yummy salad on top of toast. Okay, so we are on Day 2 of Snow, Ice and Cold Weather Cancels everything. Not that I am complaining. I would rather have my kids and husband home with me than have them off at work or school. How are we celebrating? Well, we stayed up late watching the NCAA football championship game, slept in this morning and now we are eating frozen yogurt sundaes for breakfast, in our pajamas, while watching cartoons. Good times! This recipe from Rachael Ray's Look and Cook Cookbook is not something that you could whip up after being cooped up in your house for a few days, unless you always keep radicchio and fennel on hand. Maybe you do keep this things in your fridge at all times. I had to make a trip to the store, and quite a few grocery stores at that, to get my hands on some fennel. I actually made this dish for a family dinner that we had before Christmas. It couldn't be easier to mix together, once you have all the ingredients on hand. 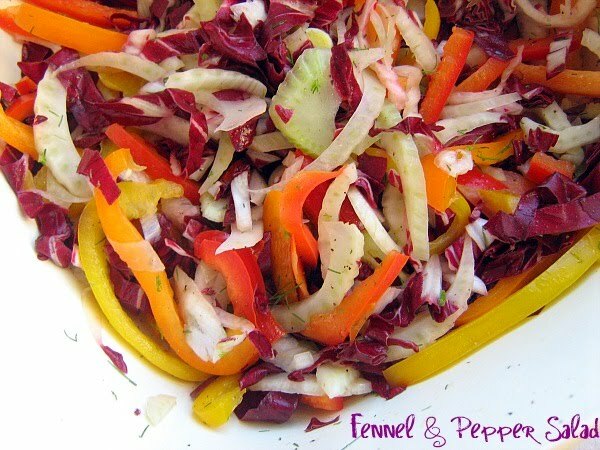 The fennel, radicchio and bell peppers make a nice crunchy, flavorful combination. If you haven't had radicchio before, it can be a little bitter and spicy, but I think it has a really great flavor, especially when combined with these other ingredients. 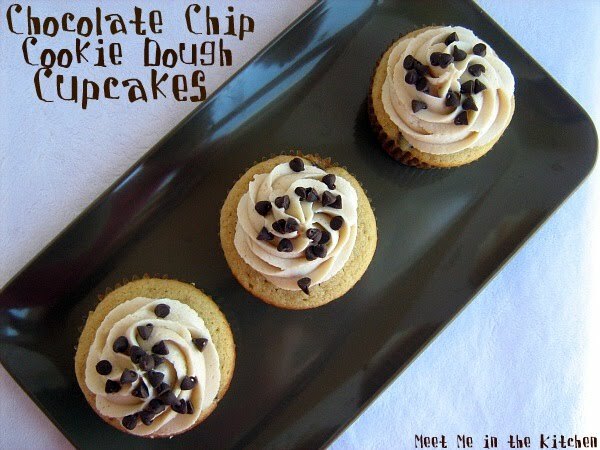 This recipe can be found in multiple places on the internet as well. I can't believe that we are snowed in! I really thought when I moved from Utah back to Georgia we were leaving the snow behind, which was just fine with me. But, the snow started to fall last night and when we woke up this morning, there was a nice blanket of snow on the ground. Luckily, they had already cancelled school, so we got to sleep in. I have the perfect thing for a cold, snowy day like today-Rachael Ray's Midwinter Minestrone. This recipe comes from Rachael Ray's new cookbook, Look + Cook. This cookbook contains more photos than her normal cookbooks and showcases some of the steps of the recipe, so you can look and see if you are proceeding with a certain recipe correctly. This particular recipe is also posted on many of Rachael Ray's websites. And it is one that she has made on at least one of her shows. This was the first recipe I wanted to try from the book because I absolutely love minestrone and love to try different takes on it. It starts out with some cubed pancetta, which I found out a couple weeks ago really gives soup a great flavor. I used about 1/2 of the pancetta called for in the recipe to start off the soup. 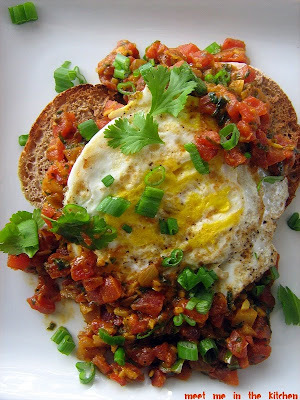 I used roasted red peppers instead of sun-dried tomatoes, simply because I had the roasted red peppers in the fridge. I really loved that this soup contains kale, one of my favorite dark greens. 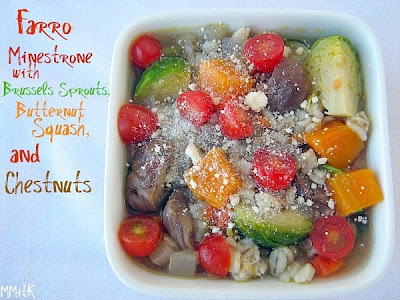 The best thing about minestrone is that it is full of vegetables, but it is also hearty enough to be a complete dinner. We didn't need to have biscuits or breadsticks or anything else with this soup because it contained all the makings of a great dinner in one delicious bowl. Has anyone else been enjoying the articles and recipes by Mark Bittman in Cooking Light Magazine? I sure have. I like his food philosophy. I can't say that I am a expert on him or what he thinks, but he has been popping up in different magazines lately and I like what he has to say. He is trying to help people realize that you can enjoy lots of vegetables/plants and less meat/animal products and still have delicious food. That isn't his only point, but it is one that stuck out to me and I agree with him. This is one of his recipes that was featured in recently in Cooking Light. I decided to make this on a weekday morning just as a special treat for me. I don't usually do that with new recipes that I want to try- I usually make them for the entire family. But, my husband hates tomatoes and refuses to eat them, so this was a special treat for me after my morning workout. I was also excited about having leftovers for later in the week. I am not a fan of runny yolks, so I decided to fry my eggs in a little bit of olive oil, instead of poaching them, although I am sure that the original way of preparing this dish is really delicious. I love curry powder and the flavor that it gives to a dish. It really added something to this tomato sauce. I loved how spicy this was. It was great. 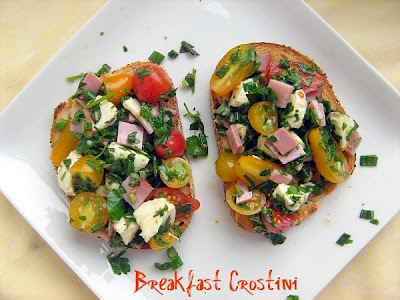 Such a yummy way to start the day, but it would be good for lunch or dinner too. I was really happy when I saw some cod on sale at the grocery store a couple of weeks ago. I had seen this quick dinner in Everyday with Rachael Ray Magazine and wanted to give it a try. In actuality, I always make a trip past the seafood area in my grocery store to see which types of fish are on sale- fresh or frozen. Then I can stock up or plan a fresh dinner with fish or some other type of seafood. 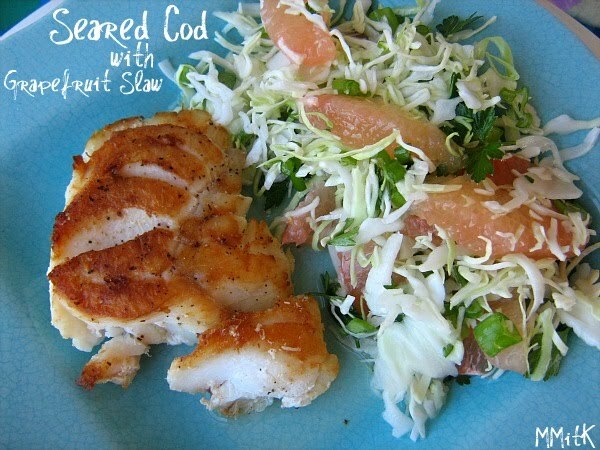 Slaw is something that pairs really well with fish and this particular slaw has fresh grapefruit in it, which is perfect this time of year since citrus is ripe and yummy right now. I should let you know that usually I am not a fan of mayo-based slaws. That is why I really liked this one, because it was simply dressed with a little oil and lemon juice. This was a quick and easy dinner that we really loved. The best part was how the cod cooked up golden brown and crisp on the outside. It was so delicious! For this month's Cooking Light Virtual Supper Club, I was given the opportunity to pick the theme. I love trying new foods, so I thought that a great theme for the beginning of a new year would be- New Year, New Food. Each member of our Supper Club chose a CL recipe that included an ingredient/food that they had never tried before. I was thinking about what food I wanted to try and noticed that there were fresh chestnuts available at my grocery store. I have absolutely no idea what chestnuts are used for and I had never tried them. My only reference for this food was the line "Chestnuts roasting on an open fire", from The Christmas Song. Then I was browsing around the Trader Joe's that just opened recently in my area and saw a package of chestnuts that were already peeled and cooked. The recipe I picked- Farro Minestrone with Brussels Sprouts, Butternut Squash and Chestnuts called for bottled chestnuts and I figured this find at TJ's was as close as I was going to get to the product I needed. I also have never tried Farro, but I couldn't find it anywhere, so I used barley instead. This minestrone was absolutely amazing. The chestnuts were a great addition to this soup. They have a really interesting flavor and texture that blended in with the other flavors magically. I know the ingredients sounds kind of strange, but I was blown away by how well all the different ingredients went together. I think the pancetta really added a great deal of flavor to the base of the soup. (Thank you Trader Joe's for carrying chopped pancetta, that is ready to use!). I didn't want the tomatoes to be cooked, so I just stirred them into our individual bowls, leaving them out of certain family member's, who think that tomatoes are deadly. I was really impressed with this soup. It was so flavorful, so healthy and so delicious. Here are the new foods that the other members of our Supper Club tried for the first time this month. Jamie tried a recipe using fontina cheese, Sandi picked a roesti casserole (I've had my eye on that dish for awhile now), Val chose quinoa, and Helene wanted to make a flan for the first time- she was unable to participate this month, but we am still including the link to the recipe she was going to try. I hope this has inspired you to try some new ingredients or foods this year. I certainly will be! I know what you are thinking. Why do my Midnight Crackles look so different than everyone else's? Well, it's because I kinda did my own thing and really tweaked this week's TWD recipe. I didn't make New Year's Resolutions, but rather I am taking this year one month at a time and focusing on a few goals each month. One of my goals/rules this month was that I am not going to buy any butter until February. This sounds slightly silly, but, I'm doing it anyway. I only use butter to bake, so basically I am restricting the amount of baking that I am allowed to do this month. I wanted to make these cookies anyway, since it is the 3rd anniversary of Tuesday's with Dorie- so I just experimented and crossed my fingers for an edible result. Luckily this cookie dough starts out with melting the butter, so I got away with using canola oil (although I did learn, from a little research, that you don't want to swap oil for butter in exact measurements). I also used semi-sweet chocolate chips, white wheat flour and mixed the entire thing in a saucepan. I had to add a Tablespoon or so of skim milk to make the dough come together. I was afraid for what might happen, but to my surprise- these cookies actually came out looking like cookies. I finished them just in time for my kids to get off the school bus and they loove them! Success! I sampled one and they are really tasty. This recipe was chosen by TWD's founder Laurie and another member- Julie, to celebrate TWD'S 3rd anniversary. I joined this group just 2 months after it started, so I have participated almost the entire time. You can find the original recipe for Midnight Crackles over at Tuesday's with Dorie, along with the links from the other members who baked along this week. Put the oil, brown sugar, and chocolate chips in a saucepan over low heat. Melt completely, stirring occasionally and remove from heat. Sift together the flour, cocoa, baking soda, salt, cinnamon and cloves. Add the egg and stir, until blended into the chocolate. Add the dry ingredients, at mix until a dough forms. If it is too dry to come together completely, add a Tablespoon of milk or so, until there are no dry ingredients visible. Line a cookie sheet with parchment paper or lightly spray it with cooking spray. Using a Tablespoon cookie scoop, form balls of dough and place them on the cookie sheet. Flatten them using the back of a spatula. 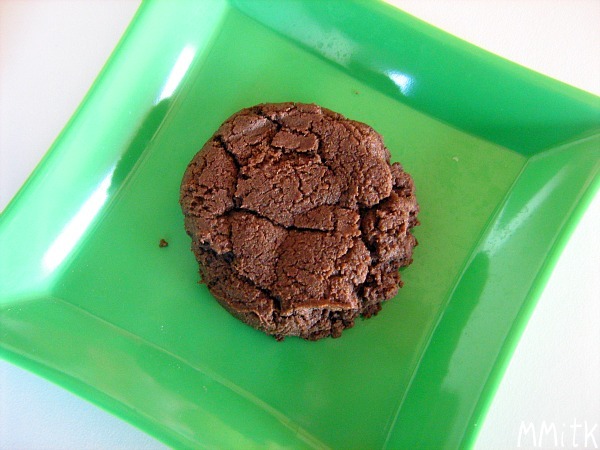 Bake the cookies for 8 to 10 minutes, until the edges are dry and tops looked baked. Let the cookies rest on the cookie sheet for a few minutes and then transfer them to a wire rack. There are certain recipes that deserve repeating. 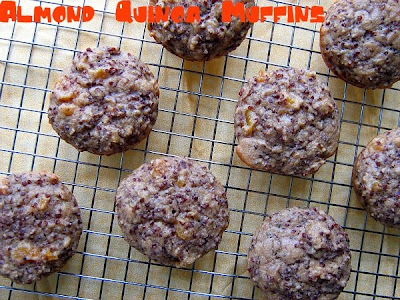 I wanted to try these Almond-Quinoa Muffins again, but this time with a few changes. They are from a great cookbook- Veganomicon- and I wanted to make them using low-fat buttermilk instead of soy milk. I made few other small changes and the muffins turned out just as delicious as they did the first couple of times that I made them. I've mentioned before that one of the reasons that I love to make muffins is that they aren't supposed to be super sweet and they can be a really healthy snack or breakfast option. These are a really great way to use leftover cooked quinoa. I love to use red quinoa when I make these because it makes them look interesting. The addition of cardamom in this muffin adds a really great depth to the flavor. 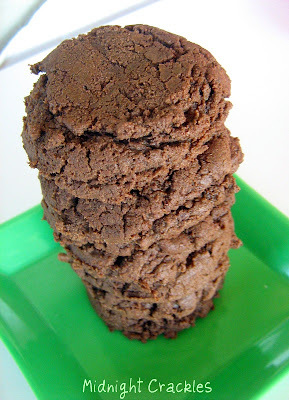 I made a double batch and still have some in the freezer, so we can pop them in the microwave for a quick snack! In a medium size bowl, whisk together the soy milk (buttermilk) and ground flaxseed. Allow to sit for 1 minute, then whisk in oil, agave nectar and vanilla. This is one of those great ideas- it really is an idea more than an actual recipe. 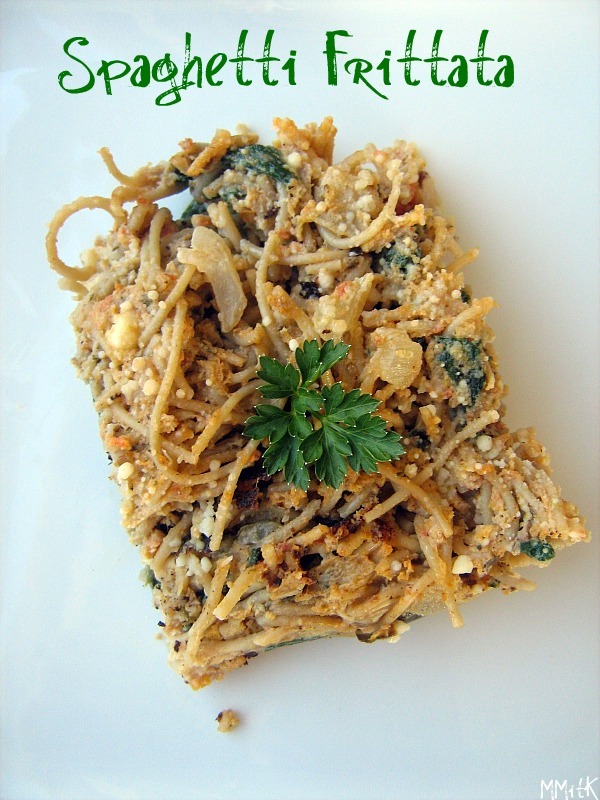 I looked at a couple of recipes for inspiration, but this take on a Spaghetti Frittata really just worked out beautifully for me. This is a great way to revamp ingredients and turn them into something else, so that you and your family don't get into the rut of eating the same exact meals all the time. 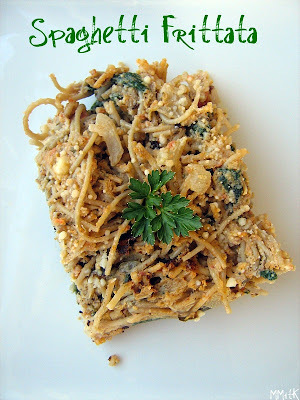 It is basically leftover cooked spaghetti, veggies, and sauce that are combined with eggs and cooked/baked. You can do it anyway you want to, and that is what makes it so wonderful. I used this Ratatouille as the sauce- I defrosted (I always end up freezing things when they make a ton and plan to reuse it a month or so later) it in a large skillet, drained some of the liquid and pureed it in the food processor. Then I cooked some whole wheat thin spaghetti noodles. Sauteed an onion, garlic and spinach. I combined all the sauce, noodles, sauteed stuff, a little feta cheese, and eggs (I used 6 eggs and 2 egg whites) in a large bowl (make sure to mix well) and transferred it to a glass baking dish to bake. I baked it at 400 degrees for about 15 minutes. You can also mix all the ingredients in an oven proof saute pan and cook it on the stove top first and then finishing it off in the oven. This was so tasty. My family appreciated the spin on a familiar dish. And since the sauce was made completely of pureed veggies, it was pretty healthy too. I can definitely see many variations of this in our future!